There are a couple of sentences in the traditional translation of the basic Christian creeds (statements of faith) that lead to confusion. Due to the literary examples below, Christian readers may find the following discussion more interesting than non-Christians—but everyone interested in clarity versus confusion should find something intriguing. The creeds offer a prime example of why it is absolutely crucial to ensure that gradual shifts in language do not undermine or blur the intended meaning of a given sentence. To illustrate, consider this line from the Nicene Creed. The potential confusion here lies in the archaic usage of the word “of.” Whose Holy Spirit are we referring to? Mary’s innate holiness and purity? The educated Christian may stumble over that dated phrase—which is still used in some denominations—but a person not acquainted with the doctrine of the Trinity might easily misinterpret it as a Maryological, rather than Christological, confession. Let’s consider two more recent translations, and note how the first restores the intent of the original writers. The second of these commonly used translations reflects the hand(s) of “politically correct” revisers. For us and for our salvation he [Jesus] came down from heaven: by the power of the Holy Spirit he became incarnate from the Virgin Mary, and was made man. (1975 International Consultation on English Texts version). For us and for our salvation he came down from heaven, was incarnate of the Holy Spirit and the Virgin Mary and became truly human. (1988, English Language Liturgical Consultation version). We will consider a second example momentarily, but let’s first look at something C.S. Lewis wrote about reflecting on the importance of the creeds. He noted that too often we rattle through the words without considering their significance. This is unfortunate. In an essay entitle “On Forgiveness,” Lewis describes a personal epiphany and offers counsel to those tempted to take familiar words for granted. But the people who compiled the Creed apparently thought that this was a part of our belief which we needed to be reminded of every time we went to church. And I have begun to see that, as far as I am concerned, they were right. To believe in the forgiveness of sins is not so easy as I thought. Real belief in it is the sort of thing that easily slips away if we don’t keep on polishing it up. As usual, the Oxford don was correct. However, just as good translations possess the power to inspire, so too poor or antiquated translations exercise the ability to confuse. Here is the promised second example. And the third day he rose again according to the Scriptures . . . (1662). Ah, I understand, think the uncatechized, the Bible teaches us that Jesus rose from the dead on Easter. Well, yes it does, but that is not the sense in which the second phrase is intended. Here, “according to the Scriptures,” means that Jesus’ life, death and resurrection were all accomplished in accordance with the promises of the Word of God. In other words, “just as was promised in the Garden of Eden and foretold by the prophets, Jesus won victory when he rose from the grave in accordance with the loving plan of God the Father.” The newer versions make that fact only slightly clearer. On the third day he rose again in accordance with the Scriptures . . . (1975 and 1988). Some of us worship in congregations using a variant of the seventeenth century creed, but at least we can take comfort in the fact that most of them have at least replaced “And he shall come again with glory to judge both the quick and the dead” with “both the living an the dead.” After all, we wouldn’t want people to think that one’s salvation is dependent upon their speed. * This slightly contemporized version of the creed has already remedied the terribly confusing term “Holy Ghost,” which evokes images of disembodied souls and hauntings. 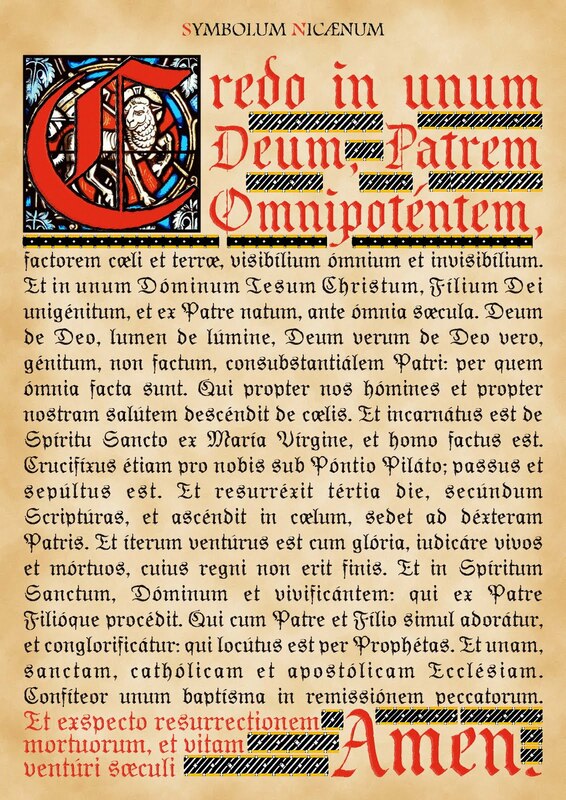 I zoomed in on the creed and read “de Spiritu Sancto ex Maria Virgine.” “De” and “ex” in Latin can both be translated “from” or “of” (as in “from the Holy Spirit and of the Virgin Mary,” for instance), but they’re definitely different. “De” has a “by means of” feel to it whereas “ex” has an “away from” or “out of” feel. One conveys static and the other motion. That last translation (1988) is thus my least favorite, where a compound object connects to the single preposition “of.” Point is (I guess), it’s good to know “dead” languages, which aren’t changing over time like the living language of English. Ha! I wrote a paper on the filioque insertion in seminary. Look at all the hoopla that word yielded! But of course that’s when Latin was still a living language. I stand by my dead language comments above (which apply to old-world Greek as well as Latin). Love your blog, by the way. You’re welcome. It’s in my job description.